UPPER EAST SIDE — Until recently, craft beer enthusiasts from the Upper East Side had very few options for indulging their tastes. Those who wanted an ultra-hoppy IPA, a chocolate chipotle stout or a proper Belgian tripel had to go downtown or to the West Side to find it. But over the past two years, the Upper East Side has witnessed the start of a craft beer scene. Three new bars have opened in the past four months alone, featuring options for everyone from the craft beer newbie to the serious connoisseur. The following establishments offer a welcome oasis in a neighborhood that was once thought of as a craft beer desert. Check them out in preparation for New York City Beer Week, which begins Feb. 21. The Pony Bar Upper East Side, which opened in May 2012, focuses on craft beer with a patriotic twist. The 20 rotating taps and two hand-pumped casks serve up specialties from American craft breweries such as Sixpoint, Victory and Harpoon. Fans of the first Pony Bar in Hell’s Kitchen will be happy to find that its sister bar is more like a twin — right down to the beer-barrel tables and $6 price tag for all pours. The Pony Bar may also be the most technologically advanced bar in the neighborhood. An electronic beer menu keeps track of which kegs are on tap, and a Pony Bar app is in the works, staff said. “Our goal is for people to be able to check in and see what each location is pouring and also keep track of which beers they’ve tried,” manager Henry Joseph said. A Southern barbecue joint with Mexican flair, MexiBBQ also offers an impressive 48 craft beers on rotating tap. The owners, who opened this second location of MexiBBQ in the fall, seek out rare domestic and imported brews. The restaurant also carries beers from local breweries, including Long Island's Barrier Brewing and SingleCut, the first brewery to open in Queens since the Prohibition. For those wanting more than beer, MexiBBQ offers fusion dishes such as barbecue brisket tacos and chicken cracklin’ guacamole. Each dish on the menu is paired with a suggested brew. Underneath the Queensboro Bridge may seem like an unusual location for a craft beer bar, but owners of The Jeffrey NYC saw the space as an opportunity. Locals have embraced The Jeffrey, which has been short-listed for Time Out New York’s Best New Craft Beer Bar award. The bar offers 30 beers on tap and one on cask brew with a selection that changes daily. In warmer weather, bar-goers can enjoy their drinks outside in The Jeffrey’s proper beer garden. Customers are also encouraged to take beer home with them. For every 10 growlers customers buy, they receive one for free. When the owners of the Amsterdam Ale House on the Upper West Side started to hear from some customers that they were trekking all the way from the East Side for some decent suds, they knew it was time to expand. In December 2012, they opened where Brother Jimmy’s once stood and have been busy ever since serving the northern end of the Upper East Side. The Third Avenue Ale House has 25 beers on tap, including six permanent options and 19 rotating spots for craft brews. They also offer one hand-pumped cask for serious beer drinkers. Bondurants NYC, which opened last month, is the latest entry to the Upper East Side’s craft beer scene. Owner Caity Prunko, who lives next door to the bar, saw firsthand the need for such a place. 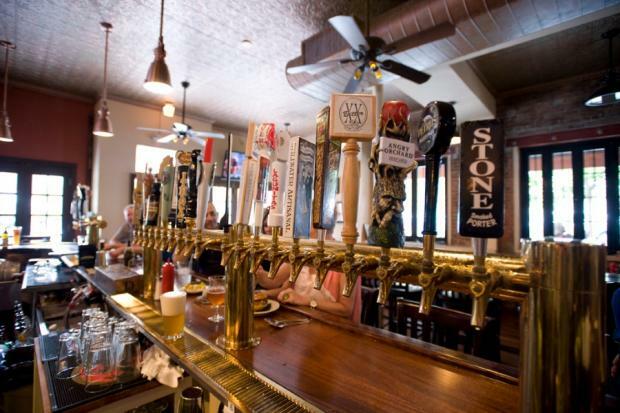 The bar's 24 taps and single cask should keep the East 80s supplied with craft brews, such as Mother Pucker sour ale from Keegan’s and Little Sumpin’ Wild from Lagunitas. Bondurants, which is named for a Virginia moonshine family, also offers an extensive selection of bourbons and will soon put two hand-crafted cocktails on tap. While not a traditional bar, City Swiggers bottle shop and taproom is a craft beer lover’s dream. The shop carries 800 different kinds of bottled beers from all over the world, including a range of gluten-free and non-alcoholic options. What really sets City Swiggers apart is the in-shop bar, which features 14 beers on tap and also pours growlers for customers to take home. City Swiggers also offers Upper East Siders a chance to learn more about beer, holding free tastings each Wednesday to highlight different breweries. It also hosts classes and meetings for groups like the Yorkville Apartment Brewers, a group of local hobby brewers. Husband-and-wife owners Alan and Pamela Rice opened the shop in November 2011 when the Upper East Side had very few craft beer options. “We were looking for a neighborhood that needed us,” he said. Café D’Alsace: This French restaurant has a beer sommelier on hand to assist customers in choosing the perfect beverage. Brasserie Magritte: This Belgian restaurant has a decent selection of mostly imported beers. Jones Wood Foundry: Known for its refined pub food, JWF also offers cask beer and a good selection of brews, many from the United Kingdom.